It has been a few weeks since I have posted about our Tot School, so I felt it was time to do a post! Livi and I had a great time this week learning about farm animals, and all things on the subject of farms! First, we started by working on animals names and sounds. I placed these animals cards from Mrs. Plemon's Kindergarten Tot School in a sensory bin with some Spanish Moss. Possibly the easiest sensory bin ever and she loved it. She did great on most of the animals names and knew all of the animal sounds! She did not know tractor, farmer, and barn but now she does! Next, we pulled out the Lego Duplo Farm Set. Olivia loves Lego Duplos and they are great for her motor skills. We built the farm and played with the animals. She was very intrigued by the instruction book so we spent some time looking at that as well! 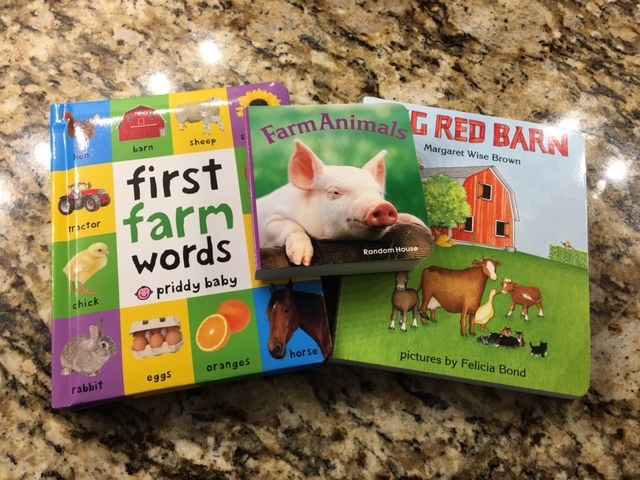 Our favorite books this week were First Farm Words, Farm Animals, and Big Red Barn. She learned so many new words which made me really proud! Our craft for the week was a cotton ball sheep! The craft was fun and simply! Materials included cotton balls, googly eyes (you can make these out of paper if you need to though) and black paper! During craft time, I focused on her gluing and her fine motor skills. I ran some warm water in the sensory bin then added some tear-free shampoo. Please with the little ones, use tear-free! You will thank me later. We also worked on hand coordination with tracing. This is not an easy concept for toddlers but so important to practice. I was really impressed with her coordination. We have some work to do, but I think for the first time, she did great! We also love doing stickers to work on fine motor skills. This Melissa and Doug Puffy Sticker Farm Set was perfect! Puffy stickers are great because they still help with fine motor but there is less "picking" involved with pulling them off the paper! Pour the heavy whipping cream into the jar, drop the marble in, screw the lid on, and shake...a lot! It takes a team effort! Finally, it will look like butter! We added a little salt to ours to make it taste better! It was delicious! We had a great farm week we are looking forward to some Fall and Halloween themed weeks very soon!